My family loves to go camping and we spend many weekends during the year in the great outdoors. In order to make our campouts an enjoyable experience, we seek to find the most useful accessories to bring with us to the campsite. 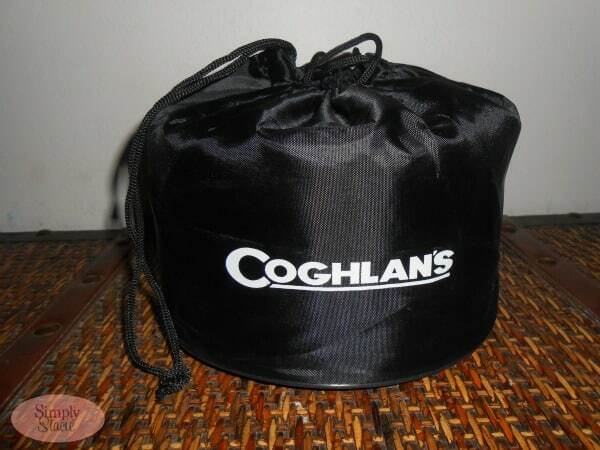 Coghlan’s is the world’s largest outdoor accessory supplier and has a vast selection for every outdoor enthusiast including campers, hikers and fisherman. This company takes pride in offering innovate essentials including first aid and survival gear, compasses, air pumps, summer gear, tools, rainwear and much more. 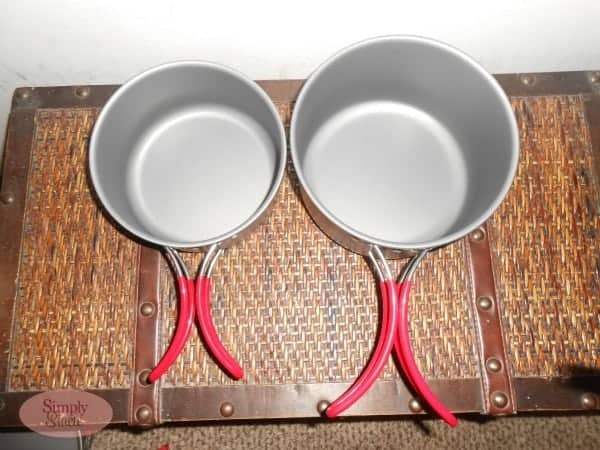 We like to do all of our cooking on a grill or over the fire when camping but had yet to find the right cookware. Therefore, I was so excited to learn about the Coghlan’s Hard Anodized Aluminum Cookset (SRP $69.99). This premium cookset combines everything that we need to make cooking a breeze when camping. It is very innovative in that the pans, pots and lids all nestle together and are stored in a carrying bag so it space saving and provides compact storage. This set is made of hard anodized aluminum so it is lightweight and durable and I really love the swing-out handles which is so convenient. Included in this set is everything needed for the best cookout ever i.e. a 7.8” fry pan, 2.7 litre pot with lid, 1.7 L pot with lid, 975 ml pot with lid, bamboo fiber pot scrubber (love this to make clean-up a breeze), a measuring cup and a handy nylon carrying bag. We used this set over the July 4th holiday and were very impressed…it evenly cooked baked beans, melted chocolate for dipping marshmallows and kept our stew heated thoroughly. In my opinion it is a must-have camping accessory! Coghlan’s also has so many other product on our wish-list including the Heavy Duty Camp Grill, a Dry Pouch to keep everything dry when canoeing (my husband ruined a $200 phone in one tip-over, waterproof Flint Striker and the Dynamo Flashlight. There is a wonderful selection of products for our kids too and I plan to stock up on a few items like the Four Function Whistle, Pond Net (perfect for tadpoles), Field Trip Bug Lab and the Mesh Insect House to make our next camping trip even more exciting and fun. You are invited to visit Coghlan’s to browse the entire selection of products designed for outdoor adventures. What a marvelous gift idea for your favorite nature enthusiast too! The disposable foot warmers look great. I would also like the #721BP – Chow Kit (Knife, Fork & Spoon Set). Would love the candle lantern! 12 Cup Stainless Steel Coffee Pot! can’t go camping without coffee!! I like the 9 Cup Stainless Steel Coffee Pot. I like their camp knives and I think they would come in handy. I would love to have the Barbecue Grill. It sounds great. I would like to try the Hikers Mosquito Net. the camp stove toaster Is really neat. I think I would be a happy camper if I had the Solar Heated Camp Shower. This cook set is very cute. I would like the Pack III First Aid Kit. 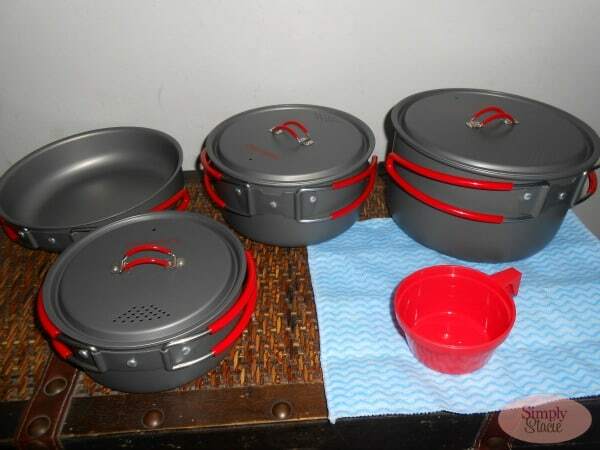 Love that cookset, it would be great for camping. I could use the Tick Remover, we have a lot of them outside this summer. Thanks! Good gracious!! Coghlan’s Hard Anodized Aluminum Cookset would be enough to complete my outdoor adventure; Item #1346, Coghlan’s Coffee Pot would be next in line on my list of ‘essentials’. I’d like to have the 4.8V Rechargeable Air Pump. I’d love the S’mores Grill. The Heavy Duty Camp Grill looks very nice!